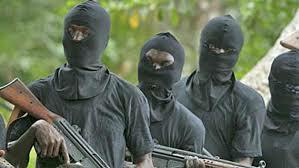 Two Catholic priests have been kidnapped in Aniocha North Local Government Area (LGA) of Delta State. The two priests have been identified as Reverend Father Franklyn Odiaka, and Rev Father Moses Nwaonwochei. They were kidnapped on their way from a special prayer service. Parishioners, who described Rev Fr Odiaka as a "prayer warrior were seen gathered in groups at the church premises discussing the unfortunate incident. Odiaka was said to have been preparing for a special marathon spiritual exercise of prayers aimed against ransom kidnappers and other criminals in Asaba and Delta State in general. The kidnap is coming barely two weeks after hoodlums allegedly broke into the church and removed undisclosed amount of money from the parish treasury.